We just wrapped up our first-ever Modern World Awards, where we put our official stamp of approval on 25 objects that have delighted us over the past year. “We’ve always thought that Dwell is something that improves our lives. We wanted to celebrate the designs that we felt really brought that spirit to the world,” says Editor-in-Chief Sam Grawe. The nominees for the Modern World Awards were on display at Dwell on Design. 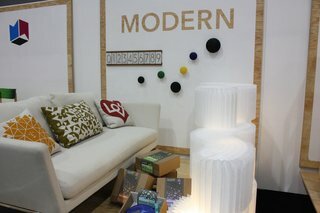 The Modern World Awards takes its name from a long-standing section of Dwell magazine called In the Modern World, which highlights new products and ideas in the world of design. 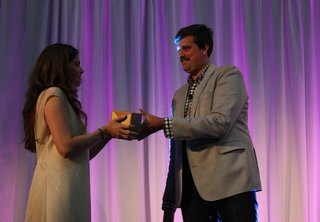 The awards were broken down into five categories: Work, Play, Eat, Live and Create. It was a difficult task to trim down the list of finalists but, after a one-day affair of discussion and number-style ranking, the Dwell editorial staff was able to identify 25 worthy objects. Then, it was up to the whole Dwell staff—everyone who worked at the office—to decide the winners. 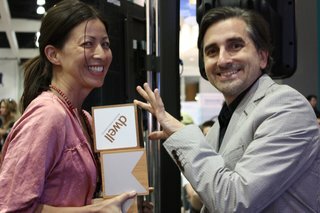 Dwell's Alli Takido and Michael Sylvester with the awards presented to the winners. Without further adieu, here are the Modern World Award winners. Work: 111 Navy Chair by Emeco with Coke. Eat: FYRKAT Picnic Charcoal Grill by Bodum. Live: Mangas Rug by Patricia Urquiola for Gan. Create: Softwall by Molo Design. Play: Bike Shelf by Chris Brigham for Knife & Saw. We weren’t alone in loving the Bike Shelf. It also took home the People’s Choice Award. The winners all received a beautiful cherry wood block produced by by House Industries. It was silkscreened with the Modern World logo created by Creative Director Kyle Blue and his team. Congratulations to all the winners! Thank you to everyone who voted and see you next year!